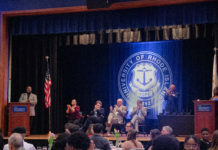 International students at the University of Rhode Island are feeling the effects of President Donald Trump’s executive order that prevents citizens of seven countries from entering the United States. A graduate student at URI from Iran, who asked to remain anonymous, planned to go visit her family overseas in March, but had to change her plans when the travel ban went into effect. “I talked to my mom and she said, ‘when are you coming home?’ and I just don’t know,” she said. The student, who said she feels not only uncertainty, but also fear, said that she isn’t able to concentrate on her studies because she doesn’t feel safe. “Are they going to come and grab me? I don’t know,” she said. The graduate student is studying at URI with a multiple entry visa and said she usually visits her parents in Iran twice a year, however, she is afraid if she leaves the country now, she won’t be able to come back. Nasser Zawia, Dean of the Graduate School at the university, said this Executive Order has created a lot of confusion and chaos. “It’s really intended to make us safe, but if you want to make me safe, I really don’t want you to rush things.” URI does educate students from the countries listed in the Executive Order, including Iran, Iraq, Libya, Somalia, Sudan, Syria and Yemen, according to Zawia. “If these students are on a student visa, they’re now OK when they’re here, but if they want to go visit their family in the summer, there’s no guarantee they can come back. So, in that sense, they’re imprisoned,” he said. The university is providing a number of services for students to reach out to if they need assistance. Naomi Thompson, associate vice president of community, equity and diversity, said the office provides resources to students for issues and counseling if need be. “If we feel we can’t provide them, we’ll direct you to the appropriate office,” she said. Graduate Assistants United at the University of Rhode Island also offers students resources on their website if they feel they have been affected by this order. “That feeling of being unwelcomed by the government, it’s kind of upsetting for everyone involved,” said Nick Constant, President of Graduate Assistants United. “Letting people talk in a way that makes them feel safe and secure about it; that’s what URI really needs to push forward some more. That’s what the people here are asking for,” he said. The travel ban was recently put to a halt after the 9th Circuit Court of Appeals unanimously decided to block the order earlier in February. If you are a student that may be affected by this Executive Order, and are seeking help, visit: www.urigau.org/immigration-help.